Moto Guzzi Recommended AGIP Rear Hub*/Rear Axle* Oil. Offers the best anti-wear and extreme pressure properties. It's exceptional fluidity when cold ensures easy and precise gear meshing even at low temperatures. It provides great thermal stability and maximum protection of ball bearings and gears. Does not leave residues and can be used at any time of year. Exceeds API GL-4/ GL-5 specifications. 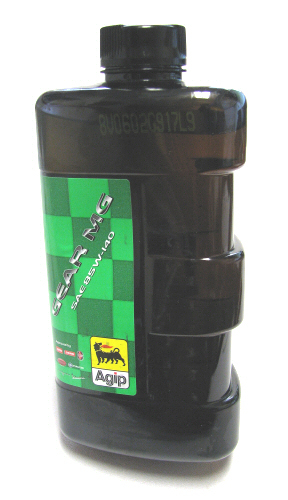 AGIP Oil, AGIP Lubricants, and AGIP Coolants are recommended for all Aprilia, Moto Guzzi, Vespa, Piaggio products. Orders containing this item can only be shipped by UPS Ground. This item cannot be shipped Internationally. *Please note: Confusingly, Moto Guzzi technical literature refers to the Rear Hub/Rear Axle as the "Transmission." This is something to bear in mind when performing service operations on your Moto Guzzi.